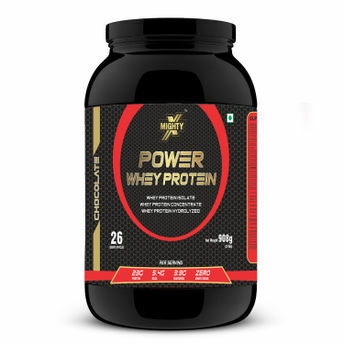 MightyX Power Whey Protein is a perfect blend of Ion Exchange Whey Protein Isolate, Ultra-Filtered Whey Protein Concentrate and Hydrolyzed Whey Peptides. Each serving provides over 3.3 grams of Glutamine and Precursors and 4.5 grams of BCAAs and each serving is enzymatically predigested in the lab for improved absorption & bioavailability. Lactase & Protease digestive enzymes also help to enhance the protein metabolism after consumption. MightyX Power Whey Protein contains high level of Anti- Catabolic Branched Chain Amino Acids. These BCAAs are used for the repair and growth of cells. BCAAs also aid in recovery after an intense workout. Glutamine & Precursors support Lean Mass Gain, recovery and boost the immune system. Explore the entire range of Lean available on Nykaa. Shop more MightyX products here.You can browse through the complete world of MightyX Lean .Alternatively, you can also find many more products from the MightyX Power Whey Protein Chocolate Powder range.